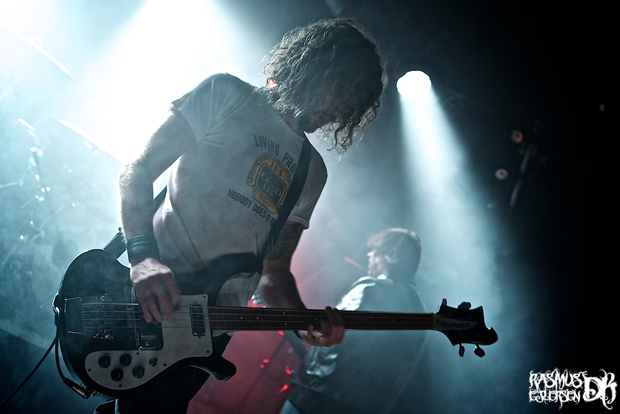 Like so many other bands this year, Monster Magnet opted to perform the entirety of their seminal album "Dopes to Infinity" on this European tour. While I have nothing against this approach per se, I have sometimes been left a little cold by the inevitable omission of many of my favorite songs by the bands that do this live, so it was with a mix of eager anticipation and a cautioned sense of skepticism that I entered Lille Vega on this cold November evening. Despite the fact that Black Spiders have been afforded considerable attention in the British press over the past few years, my familiarity with the band remains on a rings a bell level. As such I have no idea what to expect from them, but given the style of the headliners, I safely assume that the band deals in hard rock of some form. This assumption proves to be correct. 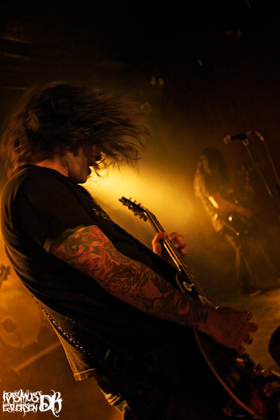 With three guitarists - one of whom is also the main vocalist - touting blazing retro riffs, Black Spiders are the quintessential contemporary rock band: classically inspired and with the same youthful exuberance that made bands like AC/DC, Black Sabbath, Led Zeppelin and the Stooges such sensational live acts back in the day; delivered in modern colors. 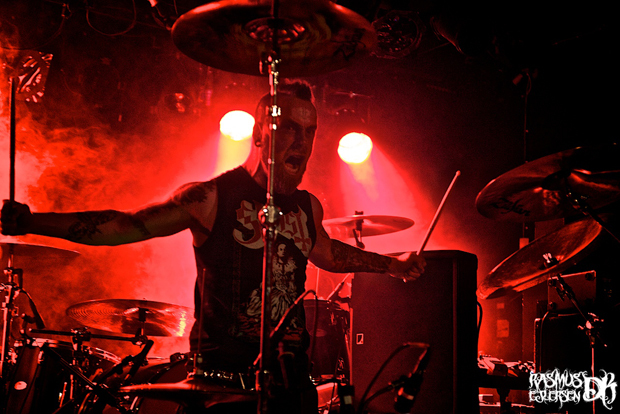 It is refreshing to see a band of this style performing with such madness, the drummer especially looking like a complete loon as he bashes his cymbals and tom toms with a deranged expression on his face, and the remaining members never so much as pausing for a breath between frantic bouts of headbanging and axe-brandishing. 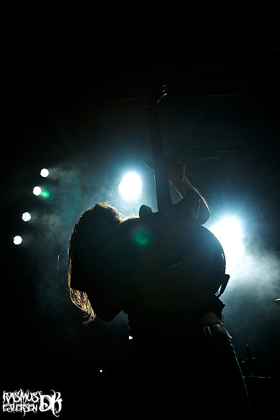 Black Spiders, it seems, have everything it takes to become both renowned practitioners of the hard rock genre and a live force to behold, and it would not surprise me if this band returned to Denmark for a headlining gig sometime next year. The crowd reaction is surprisingly strong for such a little known act. Although this is not the first time for me, watching Monster Magnet in concert, it still feels that way. 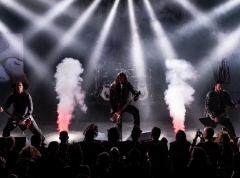 I remember watching the band at Metal Town in Gothenburg, Sweden, in 2008, but somehow I have almost no recollection of what happened, or even if it was good - and I was not drunk. In fact, the only memory I have of that particular show is that the band most certainly was (or possibly tripping), and since my interest in the stoner rock genre was non-existent at the time, I probably waved the show off as uninteresting. Much has changed since, however, as the band's latest album "Mastermind" even made it to an impressive eighth place on my albums of the year list last year, thanks to its brilliant combination of grunge with stoner rock and psychedelic elements. Tonight, however, the focus is not on the new, but on the band's most critically acclaimed album "Dopes to Infinity" from 1995, which the band intends to perform in its entirety, as is hip for a band to do these days. This presents me with a challenge, as the album is primarily a showcase for Monster Magnet's psychedelic persona. The near six-minute set opener "Vertigo" (ironically the concluding piece on the album) shows few signs of altering its course from hypnotic droning, and I'd be lying if I didn't admit it takes serious adjustment on my behalf to get into the right mindset to enjoy music as spaced out as this. But once I succeed, it becomes abundantly clear, with each passing song, why this album is considered a milestone in its genre. The atmosphere swiftly turns otherworldly, and without exaggeration it feels like the venue is transported back to a time where psychedelic drugs were still legal. "Dopes to Infinity" is, in a sense, the musical equivalent of taking mescalin (or so I'd imagine). But although the band delivers the album faithfully and with the utmost professionalism, there is a nagging sense of distance between the band and audience, as few words are exchanged and little else is happening on stage than five middle aged men losing themselves in their art. Of course this is impressive in its own right, and to call the show boring or inconsequential would be beyond naïve, but for someone not familiar with the album the songs can be quite difficult to digest. So although I am not as enthusiastic as while Black Spiders were on stage, I have no trouble recognizing that Monster Magnet are recreating a masterpiece in exactly the way that it was meant to be played. The lighting, drowsy movements and glistening chords all contribute to an atmosphere that, quite frankly, describes the album better than any words ever could. In the encore we are treated to a selection of three songs from other albums, including "Hallucination Bomb" from "Mastermind", but in the wake of "Dopes to Infinity" it becomes clear that even though these are solid songs in their own right, none of them can match the timeless brilliance of this genre-defining album.